So how do you go from feeling like this on a Friday? To Feeling like this on a Monday? You have a very bad allergic reaction to your chemo. 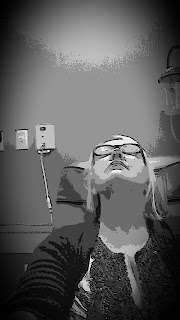 That is what happened to me at the treatment center about halfway through my infusion. My Doxil has been discontinued due to severe burn-like rashes beneath my armpits, breasts and on the palms of my hands. I am now relying on Carboplatin alone to get my CA-125 down to where it needs to be. This drug is not new to me. I have been on it first in 2012 and now since March of 2015 when I recurred. However, I now know that an allergic reaction can occur at any time, even after repeated doses. My episode began about 30 minutes after my iv was started. My throat became very dry and itchy and then my skin. I knew something was up and immediately rang for my nurse. She saw I was in distress and stopped the IV. My doctor came and assessed me and after 50 mg of Benadryl on top of the Ativan I had received as a pre-med, I was out like a light. The problem is this. I need this drug because it is working. Slowly but surely my tumor markers have been going down. So now the plan is to be hospitalized in the ICU once a month and receive the Carboplatin very slowly over the course of 2 days to try and desensitize me to the drug. The ICU is used for obvious reasons. Anaphylaxis can kill you. After being kept and observed over an hour I was deemed stable enough to go home. I spent that night and yesterday on the throne with diarrhea, or else comatose in bed as I continued on Benadryl. The only good thing is my reaction wasn't severe enough to require Epinephrin or hospitalization. So once again I'll count that as a blessing! Today I feel pretty good. I'm disappointed naturally, that I was unable to get my full treatment, but I'll update here next week when I get the lab results of my CA-125. So everyone have a a good week and a lovely Labor Day weekend. Thank you all for your continued support and well wishes...and those all important prayers! UPDATE :CA-125 DOWN TO 54!!! !